Your reports of sighting monarchs or their immatures (eggs, larvae, pupae) on a weekly basis are important! Your data reveals information about the monarch population in real time. It also tells us when weather extremes begin to affect the monarch life-cycle either helping it expand or contract in response. Be our eyes in the field around the southwest. How valuable is your data? In Fall 2016 we heard from Citizen Scientists in Arizona, Utah and Nevada regarding late sightings of larvae on milkweed. These reports helped us anticipate a late generation of monarchs into November that we may have missed otherwise. We were able to notify taggers in key locations to monitor fall nectar sources. As a result an additional 1,000 monarchs were tagged with 19 recoveries in California and Mexico for the season. You can use this Excel spreadsheet then email the report to info@swmonarchs.org. If you have an I-phone or I-pad please consider using Nature Digger’s Monarch SOS free app. It’s easy to use. Report your sightings to Journey North. Please take a screen shot of your submission and email it to info@swmonarchs.org. If you prefer to use an app in the field, you can use the iNaturalist Southwest Monarch Study Sightings project. How often should I send in sighting reports? Please send in your report weekly so we can identify changes in monarch absence and presence. You can also send in a sighting for a monarch you see in a unique location when you are traveling. How can I identify monarch larvae instars for my report? A Field Guide for Monarch Caterpillars by Karen Oberhauser and Kristen Kuda has easy to read information and photos to help you. Why does the condition of the adult monarch matter? In Spring, worn and tattered monarchs are often a sign of remigrants from California or Mexico returning to the breeding grounds in the Southwest. In contrast, freshly eclosed monarchs are fresh and new, a sign of a new generation. As monarchs breed and lay eggs, they lose scales and look more aged. Migrating monarchs are usually large and bright in color. We can learn much by your reports of the monarch condition in your reports. Do I have to include a weather report? No, you don’t have to, but including this information gives us a fuller picture of the field conditions. Monarchs usually are not flying until temperatures reach the low 50’s in sunny conditions. In warm temperatures migrating monarchs may use thermals rather than speed flight near the surface. 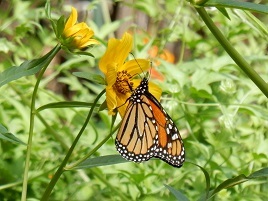 High winds may stall monarch movement or push them in another direction. By providing as much information as you can you create a snapshot of your monarch encounter. Thank you for your time and data! Please contact us at info@swmonarchs.org with any questions.